Identifying, treating, and preventing the parasite and its debilitating impact. 1. Jiggers are parasites that are recognized by many names including the Tunga penetrans, sand flea, chigoe flea, pique, and bicho-do-pe. Jiggers should not be confused with chiggers. 2. Jiggers are the world’s smallest fleas, measuring less than 1mm in length, but they can swell to over 1,000 times their size when feeding and laying eggs. 3. 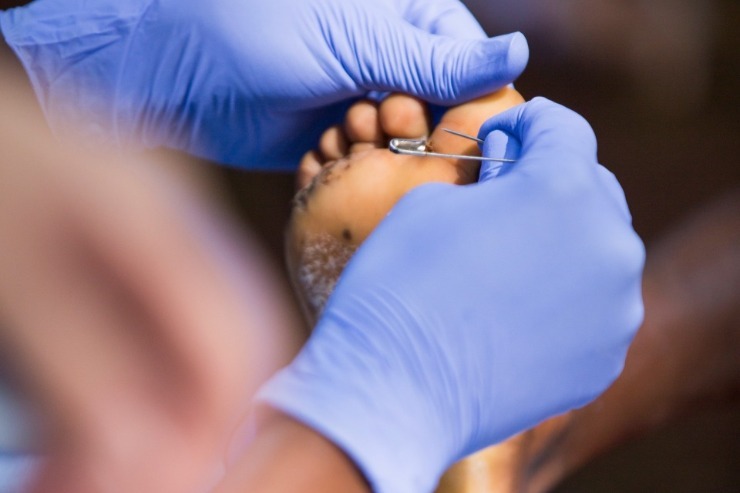 The first recorded case of jiggers dates back to the early 1500s, when jiggers wreaked havoc on the crewmen aboard Christopher Columbus’ Santa Maria when they became shipwrecked on Haiti. 4. The Thomas Mitchell ship is infamous for transporting jiggers to Africa in the late 19th century. The outbreak started in Angola around 1872 and by 1924 jiggers had invaded Uganda, Kenya, Malawi, Mozambique, Sudan, and Madagascar. 5. Jiggers thrive in warm, dry, and sandy climates such as beaches, deserts, and areas with lots of dirt or dust. 6. Unlike most fleas, Jiggers are not very good at jumping. On average they can jump only 8–15 inches, making feet their easiest target. Other areas of the body are susceptible to jiggers if an individual sleeps, sits, or crawls on the dusty ground. 7. The fertilized female jigger is responsible for burrowing into the skin of an unsuspecting host. She burrows her small head into the flesh, working her way deeper and deeper until she reaches a blood source to feed on. 8. She will feed and grow for up to 2 weeks, continuously laying eggs over the duration of her invasion. 1. Once a jigger bites there is a severe itching sensation, but the small size of the jigger makes them initially undetectable. 2. When the female reaches her blood source and begins to lay eggs and grow, a tiny black dot appears in the center of a lesion. This dot is her abdomen sticking up to allow her to receive oxygen and excrete waste while feeding. 3. As jiggers swell and lay eggs, this creates little pockets in the skin which range from 4–10mm in diameter. One egg then turns into many eggs, and even egg sacks. 4. The swelling of the jigger as she lays more eggs creates incredibly painful pressure points underneath the skin. Because of this, adults become unable to care for their families and children stop going to school. 5. Over time as the eggs multiply, they destroy soft tissue which makes victims vulnerable to infection and disease. Extreme cases can result in loss of nails, disfiguration of the feet, gangrene, and loss of limb. 6. If the female lays an egg sack, it will fall off at the end of the mother’s life cycle, bringing her along with it at which point the larvae will reside back in the dust and dirt until they reach maturity. 7. Sometimes, if the female does not lay eggs or detach with the egg sack, she will die under the skin and will remain until removed. Now that you know everything there is to know about jiggers, you too can help to prevent this painful parasite from harming others! If you feel empowered to take hands-on action, you can host a Shoe Party or a Care Kit Party, prepping the materials that are dispersed to those who need them most. For more information on party hosting, visit our partner, Sole Hope, at www.solehope.org/host-a-party.